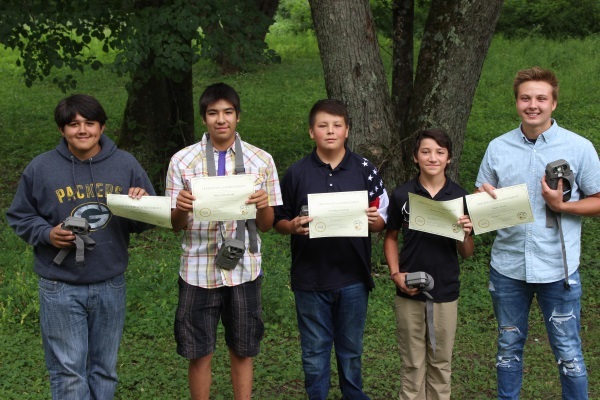 Chris Shawley, Austin Potter, Silas Cleveland, Isaac Lowe, and Geoffrey Garvin had a few tales to tell about their experiences working for the Ho-Chunk Nation Department of Natural Resources (DNR). Those stories were told at an end-of-season wrap-up on Thursday, July 26, at Perry Creek Park near Black River Falls. The youth offered a PowerPoint presentation to all people in attendance, including parents, siblings, friends, and DNR staff. Each of the youth workers took turns to explain their experiences as each toggled through the presentation. Karen Blodgett, a state employee in charge of the Community Financial Assistance grant, the source to pay salaries of the youth workers, also was present. At the end of their presentation, Ho-Chunk DNR Executive Director Greg Blackdeer presented each youth worker with a certificate of accomplishment and a new trail camera. During the PowerPoint presentation, the youth workers offered a day-by-day account of their natural resources activities for 23 days. The youth went through a variety of hands-on learning experiences. Some of them include, how to plant a tree properly so that it will stay alive and grow, how to estimate the height of a tree based on a sighting from a distance, and how to measure the density of a red pine plantation to see if thinning is necessary. They also planted a row of black hill spruce, learned about unintentional drug poisoning, and how to put grow tubes on oak saplings so that deer would not eat the buds. They went out to look for elk and deer while putting up trail cameras, listened on the frequency box for different frequencies from each of the collared elk, and hiked at Levis Mound. Other activities include studying telemetry at Lake Wazee, going to Alma Center and cutting down a tree that was in danger of falling against a nearby house and shed, weeding at Whirling Thunder near Tomah, and learning about foraging on native plants. They went to the former Badger Ammunition Plant to pick up broken telephone poles, removed a fence at Whirling Thunder and placed small tarps around trees, and went to White Otter and learned about prairie grasses and learned about prescribed burns. On the last week of their work, they checked on the trail cameras that they put out the previous week and learned how to work on a formula worksheet to see how many deer per acre were in the area. They went electrofishing in two locations on the Kickapoo River and shocked fish, collecting some crayfish and a lamprey, took down an old barbed wired fence at the Kickapoo Reserve and learned about making hiking, biking, and horse trails. At Dells Dam, they investigated animals’ tracks to determine which animals made those tracks. They went to a red pine plantation to look at the density of the forest and how much sellable timber could be derived from the trees. On the last day, they went to Kickapoo Valley Reserve to look for black ash trees with Kjetil Garvin and learned about water hemlock and what natural food could be eaten in the forest. “We enjoyed working with the youth workers and ran into a few logistic issues over the six-week program. Initially, we had difficulty finding youth for the program,” Blackdeer said. “The week prior we only had one applicant, so I held off on the start date. We intended to begin the program on June 11 and pushed the first week back to June 18, with one youth starting on June 25. We created a weekly program for the youth to work in wildlife, forestry rural and urban, land management and agriculture. Finally, a day was left open each week to complete the end of year report,” he said.